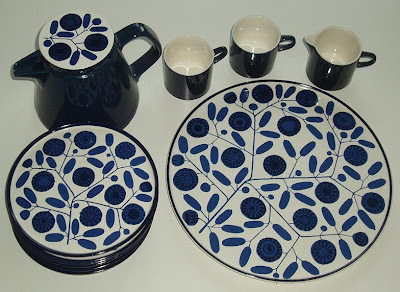 Major technology melt-downs have prevented me from blogging for a while, and I still have quite a lot of thrifted loveliness to photograph and post, but for now, here's a gorgeous 1970s Melitta Stockholm coffee set. I found this in a charity shop in a nearby town, and the logistics of getting it home safely by bus were challenging to say the least. A trip to the £ shop for bubble wrap, and the fruit market for a wooden crate (quite lovely in its own right) sorted the "safely" bit out. It was bloody heavy, though, and quite hilariously I chose the only day in living memory when the usually reliable buses were running an hour late and were absolutely packed! I think it was worth it, though. Oh they are georgous! I love blue and white. Oh Melitta. Such a wonderful set in a timeless pattern!! i love the design :D what a find! Well worth the trouble - very unusual pattern!